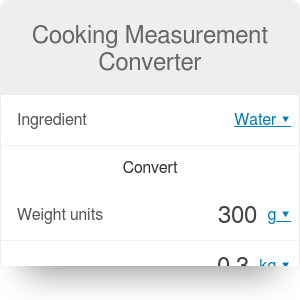 With this cooking measurement converter, you can convert any recipe into the units you like. But, it's not a regular converter, it can freely switch between volume and weight units as well, not just one or the other. Isn't that awesome? So, not only grams to cups, but also grams to tablespoons or cups to pounds. Don't have a kitchen scale or you don't know how many teaspoons in a tablespoon? No problem. Wondering how many tablespoons are in a cup? We've got you covered here as well. Just remember that we've taken the average values of product density, so your ingredient may differ a bit. Also, it matters how tightly you pack the container, so the result obtained is a rough approximation. If you want to understand what's the difference between various conversions, and why we need the ingredient type to perform cooking measurements, read on, and you'll find the answer. Also, we've decided to add sticks of butter as in the US butter comes in 2 or 4-stick packages. And if you're wondering how many teaspoons are in a tablespoon, the answer is simple: 3. No matter if you're using US type of spoons or 5 ml spoons - as long as you're sticking to the same measurement system, one tablespoon is equivalent to three teaspoons. So, if you want to calculate e.g. how many grams are in a cup, you need to know if it's a cup of sugar, a cup of flour or honey. In this kind of conversion we cannot provide one general conversion table - it would differ for every ingredient! In our cooking measurement converter, we've chosen seventeen essential ingredients. In some categories, you can even specify the type of the product! Choose the ingredient. Let's start with the first product: butter. If your product is not on the list, but you know the ingredient's density, just hit the Advanced mode button and change the density value. Enter the amount. In our case, it's 125 grams. Use a drop-down list if the unit you're looking for is not visible. Here you are - the converter did the job! Now you know that 125 grams is a bit over one stick of butter (1.1) and it's equivalent of 0.55 of a cup. Repeat the same steps for the other two ingredients. For sugar you've found out it's around 2 oz, and also that you need 1.3 US cup of flour. Then, just make a dough and bake the shortcakes for 15-20 minutes in the oven heated to 190 °C. Well... If you have no idea how much that is, check our temperature converter to convert into the Fahrenheit, Kelvin or any other temperature unit you want. Also, we strongly recommend having a look at our great pancakes recipes. Whether you'd like to prepare a simple pancakes or crêpes for you and your friends and family, or you're even more ambitious and you'd like to test 15 unique recipes of pancakes from all over the world, we've got the ideal tools for you. Cooking Measurement Converter can be embedded on your website to enrich the content you wrote and make it easier for your visitors to understand your message.